It is finally warm and sunny here on campus and it feels like spring. Along with spring comes Pan-Hel week. Wabash Pan-Hel has taken a variety of forms. For most of its history Pan-Hel meant a weekend of dances. In earlier times these dances and parties were heavily chaperoned. This picture is of the Kappa Sigma fraternity in 1900. At that time the fraternities were not residential, merely social. Each fraternity had a “hall” which occupied the top floor of a downtown building. They held their meetings there and all of them were large enough for dances. 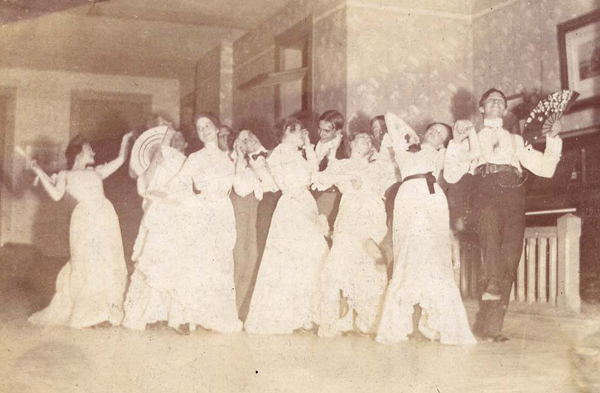 In Wabash College the First Hundred Years we learn that the pride of the fraternities was the smoothness of their dance floors. From that same source we also know the location of this photo. The Kappa Sigma fraternity occupied the top floor of the Music Hall which was known to later generations of Wabash men as the Strand Theater. As the weather warms, the students gear up for the bed races of Pan-Hel and a block party on the mall this weekend. A different time and yet it is fun to look back at other eras.